When Trump first unveiled his tax plan a year ago, it was criticized for being too expensive and too favorable toward the rich. On Thursday, Trump responded to those critics by revealing a major overhaul to his original plan. 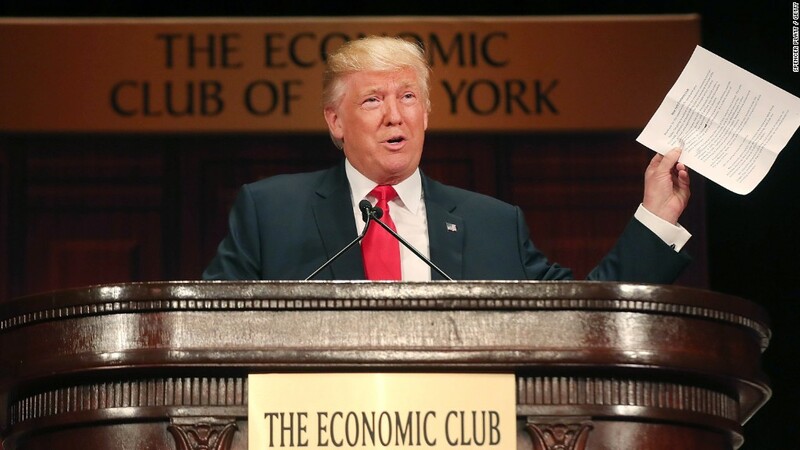 Speaking at the Economic Club of New York, Trump outlined big changes, including new standard deduction levels and tax brackets, among other things. He claimed his new plan will now disproportionately benefit "the working and middle class taxpayer. They will receive the biggest benefits -- it won't even be close." He also asserted that his new plan will cut taxes by $4.4 trillion in the first decade, which is considerably less than the more than $10 trillion that outside analysts estimated his original plan would cost. Factoring in assumptions about how changes in tax policy will affect economic growth -- Trump claimed that his new plan would only cost on net $2.6 trillion. Based on the details released by the Trump campaign Thursday, "it is fair to say that this plan is less costly than the previous one," said Kyle Pomerleau of the Tax Foundation. But just how much less costly can't be independently assessed until outside groups like the Tax Foundation and the Tax Policy Center more closely analyze his revised plan. Under his new plan, Trump would increase today's standard deduction to $15,000 for individuals and $30,000 for married couples. But that's well below the $25,000 standard deduction for filers ($50,000 for couples) that he called for last year. His enlarged standard deductions had been the single most expensive part of his original plan. So presumably the more modest size he proposed Thursday will help reduce the overall cost of his plan. The originally proposed standard deduction also is what provided lower and middle income families with their biggest tax break. In a speech in August, Trump indicated he would align his proposed individual income tax rates with that of the House Republicans' tax reform plan. They both reduce the number of tax rates from 7 to 3, and set them at 12%, 25% and 33%. That's well above the rates of 10%, 20%, and 25% that Trump originally proposed last September. And on Thursday, he unveiled how much income would apply to each of those rates: Income below $75,000 for married couples will be taxed at 12%, income above $75,000 but below $225,000 will be taxed at 25%, and all income north of that will be taxed at 33%, according to materials posted on his campaign site. The limits for single filers would be half those amounts. Trump has said he wants to limit itemized deductions but never specified how. On Thursday he said individuals would not be allowed to claim more than $100,000 in itemized deductions or $200,000 if married filing jointly. That doesn't seem to be particularly onerous. Except for the very wealthiest filers, most people would have a hard time hitting those levels. "This is a very small cap if you think about it. How many people have $100,000 in itemized deductions? Not that many," Pomerleau said. Last year Trump called for all business income to be taxed at 15%, including for very lucrative partnerships such as hedge funds and law firms. But campaign materials on Thursday only specify that corporations would be taxed at 15%, well below their 35% top rate today. So presumably that means income from partnerships and small business will be subject to the top 33% income tax rate, which is still less than the 39.6% top rate in effect today. It also could mean that hedge fund managers will pay more than they do today, because Trump would eliminate the preferred tax rate they get on a portion of their income called carried interest, which is a share of a fund's profits. Today the maximum rate they owe on carried interest is 23.8%. Trump and his campaign this week detailed three new tax breaks he'd offer to help parents shoulder the high cost of child care. While family and worker advocates are glad to see politicians start to address issues of paid leave and assistance for workers on child care, they're not wowed by Trump's proposals, an analysis of which is here.